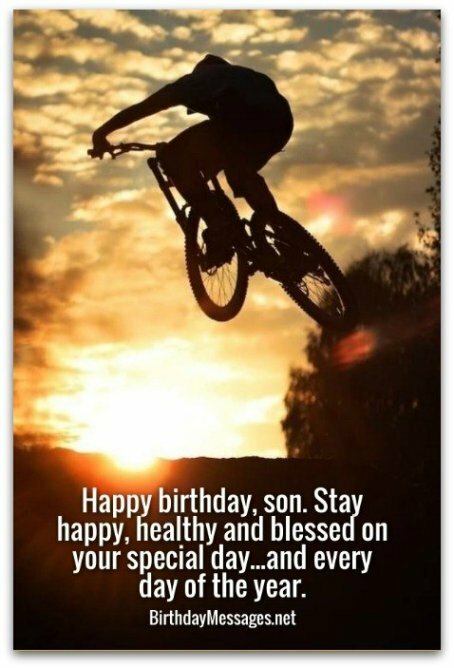 Son birthday wishes, at their very best, can be as beautiful and unique as your son. 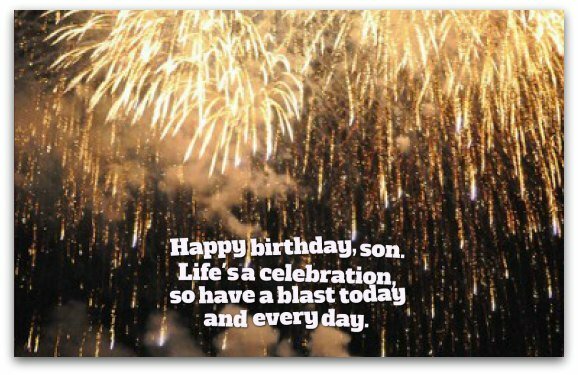 With my original birthday messages for sons, you can find just the right (one-of-a-kind) verse for your child on his special day. 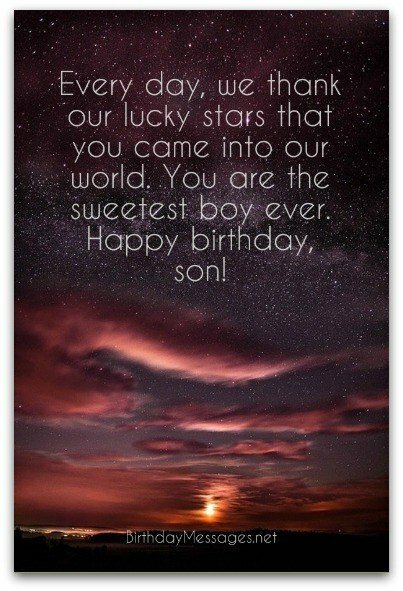 Just pick the birthday greeting that helps you best express the love, pride and dreams you have for your beautiful boy. Simply let the words below take you where they will. Need some help along the way? 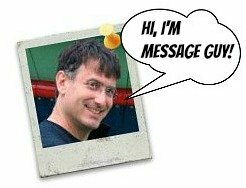 Check out my Message Guy Tip below. Sons are the perfect blend of wonder, warmth, joy and love. But figuring out what to write for them is hard. The young ones care more about their gifts. The older ones dislike “mushy” messages. You could write almost anything for adult sons. The best route? A mix of cute and happy...with a touch of the sentimental (and a sprinkle of pride). The son birthday wishes on this page (and the next page) incorporate the messages from these article, but feel free to add your own. Simply start with an option below that best captures your feelings...and go from there. Son, we think the world of you and love you very much. We hope you have the happiest birthday and an even happier, healthy future. Son, no matter how old you get, you'll always be our little prince. Hope you have a truly wonderful birthday. Thank you for letting us be the best parents we can be, just by being yourself — a wonderful, wonderful boy. We're so fortunate to have a fantastic son like you. You've always been a beacon of light for us. Happy birthday, son! Happy birthday, son. Stay happy, healthy and blessed on your special day...and every day of the year. You're a one-in-a-billion miracle to us. You have blessed our lives with your funny, kind and caring ways. Happy birthday! Every day, we thank our lucky stars that you came into our world. You are the sweetest boy ever. Happy birthday, son! 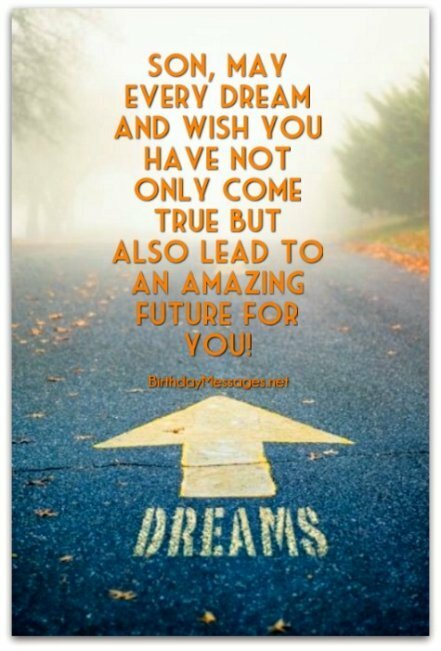 Son, may every dream and wish you have not only come true but also lead to an amazing future for you! Son, may you have an incredible birthday. Even if it's only half as wonderful as you, it will still be the biggest birthday celebration of the year. Happy birthday. Son, you're our greatest blessing. May your birthday and all your tomorrows be blessed with everything good in life! Loving you, son, is our greatest joy. You make it so easy. Happy birthday, dear boy! We've always been proud of you. Now more than ever, our hearts are bursting with pride, because you've grown into a remarkable person — so full of love, caring and joy. Happy birthday, dear, dear boy! Son, you are a shining example of everything that’s right in this world. May your future be as bright, starting with your special day. Happy birthday! Words are simply not enough to express how amazing I feel to have you as my son. I love you. You make my life complete. Happy birthday, son! Need help? We’ll be there. Celebrating? We’ll be there. Just want to talk? Count on us to be there. It’s not because we have lots of time — we have lots for you. Happy birthday, son! This is one of my top picks because it's all about living in the moment, the type of message a father or mother would want to express in a card or eCard for their son. Imagine how much your birthday boy will appreciate this birthday message. A lot, I bet. Who wouldn't? Yesterday’s echoes bring back sweet memories of you. Tomorrow holds the promise of sweeter moments. 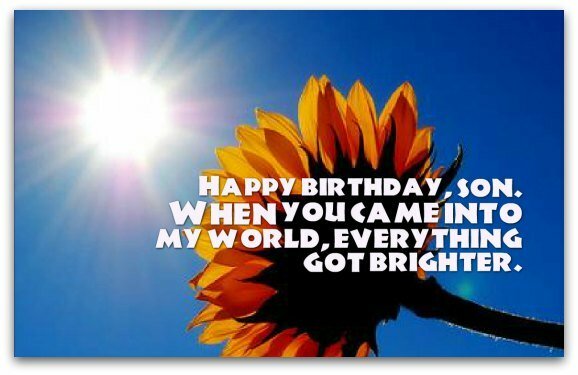 May today, your birthday, be sweetened with the joy and wonder you bring everyone. If I look at everything in my life, you're easily the best part of it. 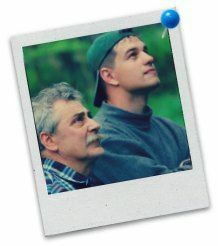 Through thick and thin, you've been an extraordinary son and a wonderful man. Happy birthday, son! Every single day since you were born, you've added something amazing to my life. I can’t imagine my life without you in it. Happy birthday, my beloved son! Wisdom is not a gift we can give you, son. It’s something you must earn — and you've become so wise over the years. Happy birthday, our wise, kind man! A big “happy birthday” to an amazing son and an even more amazing man. We're so lucky to have such a great son like you. Happy birthday, kiddo! You have been much more than a source of pride and joy for us — you've been a source of infinite inspiration. Happy birthday, son! Happy birthday to the world's greatest, kindest and still-my-little-boy-at-heart son. No matter how many of your birthdays come and go, you will always be my little slugger. Happy birthday! When we think of you, we can't help but feel immense pride, joy and, most of all, love. Happy birthday, dear boy! Some sons are not very comfortable with birthday wishes that are too cute or heartwarming. For them, you may want to dial back the sentiment a little. Choosing shorter, more lighthearted “happy” birthday messages may be a better way to go. Happy birthday, son! May this year be your best ever! Son, hope your birthday is as incredible as you! May your birthday be filled with lots of cake, gifts and cheer! Your future looks so bright. Happy birthday, son! Have a great special day. Son, you deserve the best-ever birthday! Wishing you a very happy birthday and wonderful year! Thanks for being a great son. Happy birthday! Enjoy every moment of your birthday…and every piece of your cake. Happy birthday, our remarkable young man! On your special day, hope you get everything you wish for…and more!